The 2015 VIVO Conference was held in Boston, Massachusetts, August 11 - 14, 2015. It was an opportunity for stakeholders and interested community members to exchange information in many areas related to the theory and practice of what it means to "connect, share, and discover" with VIVO, an open source semantic web application. 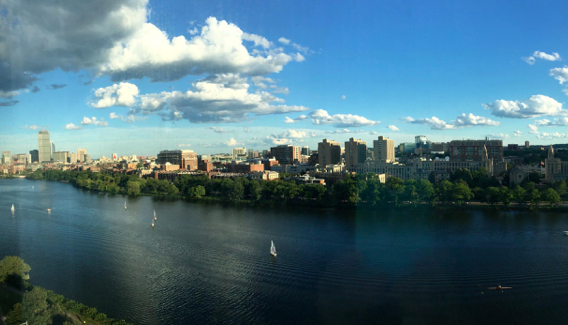 View of the Charles River from the VIVO poster session and reception. The 2015 VIVO Conference held in Boston, August 11 - 14, 2015, was an opportunity for 185 stakeholders and interested community members to have a 3-day exchange of information centered around the theory and practice of what it means to "connect, share, and discover" with the VIVO open source semantic web application. Conference organizers offered workshops and sessions on related VIVO topics including the scholarly ecosystem and team science, linked data and ontologies, research networking system optimization, analytics and organizational strategy, and implementation highlights, all aimed at providing an integrated view of the scholarly work of an organization. The VIVO Conference is somewhat different from related types of technology conferences. Many conference delegates were researchers, field practitioners and/or faculty members with active institutional VIVO "profiles". Attendees included committed users of VIVO technology, participants in scholarly research networks, and key stakeholders in VIVO technology and ontology advances. Knowledge is built not only on published research findings, but also on understanding the scientific and scholarly provenance around discovery. What was the process around how a discovery came to be known? Who, and with which institution was it brought forward? Who were the collaborators? How was it funded? What was the chain of scholarly validation and review around asserting that the discovery was true? In the past a scholar might have kept an extended chain of connections and related information in his or her head and in a home-grown series of documents, bibliographies, data, presentations, correspondence and contact lists stored on and offline, along with a record of publications. Fellow scholars, institutions and funding agencies that are stakeholders in ongoing research did not have common infrastructure to share an understanding of informal or one-dimensional networks and corresponding related information. The ability to gather the threads of discovery within an institution or field to see a complete picture of research dependencies and connections from multiple viewpoints was a missing piece of scholarly infrastructure. Enter VIVO  a way for scientists and scholars to represent their work, their interests and their network of connections and collaborators. VIVO institutional profiles, connected to multiple data streams that can include human resources, publications, course catalogs, funding agencies, teaching resources, external institutional data, patent information and more are now openly discoverable on the web. Delegates to the VIVO conference are passionate about advancing VIVO because it is both an open source tool and an active community of practitioners that together make integrated views of the scholarly work of individuals and organizations visible, accessible and discoverable in the interest of moving scientific and scholarly research forward. VIVO Project Director Mike Conlon welcomed delegates to the VIVO conference. Conlon's progress report highlighted VIVO 1.8's modular and performance improvements adding that we are "heading for interoperability across triplestores", integrated search capabilities, and improved processes for turning contributions into deliverable components. He praised the VIVO open source development community for ongoing and remarkable volunteer efforts to advance the software. In the opening keynote address David Weinberger, Senior Researcher at Harvard's Berkman Center for Internet & Society, posed the question, "How can VIVO make the Internet better?" He asked the audience to consider three ideas in determining the Internet's effectiveness as a force for positive societal change: is the Internet really exceptional technology (cyberexceptionalism); does the technology behind the Internet affect people deeply and leave them feeling like they have no control over it (technodeterminism); and is the Internet a benevolent force for good or are our brains being rotted by constant interactions with online media (cyberutopianism)? Audience opinions were polled informally and ranged the whole gamut from idealists to skeptics. Weinberger went on to illustrate that the "argument of (web) architecture" where values are assumed to be embedded for the greater good is "classic technodeterminism". Users tend to feel that whatever happens online is inevitable, hidden, and beyond their control. Calling Facebook "a billion person prototype" he said that he and colleagues at Harvard's Berkman Center for Internet & Society are depressed because prevailing online technology seems to supersede other, more individualistic, ways to affect societal change. He concluded by encouraging audience members to remember our human origins and shared history to ensure that the Internet delivers on the promise of making the world a better place. Dr. James Onken, Senior Advisor to the NIH Deputy Director for Extramural Research, was also a keynote speaker. He shared information about the Research Portfolio Data Infrastructure at the National Institutes of Health aimed at improving the ability to demonstrate long-term benefits of research investments. Invited speakers included Dr. Justin Starren, M.D., PhD., FACMI, Chief, Division of Health and Biomedical Informatics, Department of Preventive Medicine, National Institutes of Health (NIH). Starren's research focuses on the translation of computer and informatics research into real-world solutions. He offered a glimpse of Research Networking Systems (RNS) as key component of biomedical research in an era of big data and distributed research teams. Ina Blümel, acting professor at Hanover University Applied Sciences and Arts, presented on the need to grow the future of interconnected research platforms by supporting university curricula teaching linked open data principles. She uses VIVO as a teaching tool to help educate students about what open science means and how they can become part of an interconnected research world by learning to think in terms of objects and relations, not solely attributes. The Associate Director for Programs at the National Information Standards Organization (NISO), Nettie Lagace, was also an invited speaker who offered views on the related nature of standards and interoperable data exchange. "Standards do the heavy lifting and help you go where you're going faster," she said. She reviewed examples of NISO areas of work and projects that include content and collections development (description), business information (solving business problems and making decisions), and discovery and delivery (focused on user needs and actions). Recommended standards and practices around Altmetrics (alternative assessments) are based on data beyond citations. Lagace reiterated that establishing trust and verifying community support for standards-based assessment is critical to the overall process of scholarly activity. A demonstration search of library bibliographic resources with scholarly profile information and other types of annotated, linked and open data across Cornell, Harvard and Stanford libraries is the goal of this two-year Mellon-funded project. The partners are assembling a flexible ontology standard that will enable the exchange of library information in order to "break out of library silos" to enrich our scholarly resources. The LD4L ontology refines the BIBFRAME ontology proposed by the Library of Congress and reuses components of the VIVO-ISF ontology along other standard frameworks. Krafft reviewed use cases that illustrated how to take advantage of many LD4L data combination capabilities. A management tool for virtual collections across collaborating libraries is one of several potential applications. A full cross-institutional catalog search demonstration will be available in January 2016. Jon Corson-Rikert noted many open questions and issues: how will LD4L data scale up to the real-world magnitude of library catalog data; how will geographic data be added for record enrichment and assessment; more stable and persistent URIs will be required to take advantage of queries; and how can the "deep scholarly graph" be leveraged to surface more relevant works? Symplectic upgraded their harvester to update mappings to VIVO-ISF earlier this year. In upgrading the data translations to the VIVO ISF ontology Triggs reviewed the lack of standard types, especially in activities, when mapping to a structured ontology. He pointed out that definitions alone aren't a full mapping solution. Structure matters. For example some fields map to objects and some objects map to fields. A professional activity is an object with controlled fields, but when mapped to VIVO you have to do more object-level joining. This means you need to assign IDs when converting a field to an object, and then map those several references to the same ID. List the fields per object/class and assign them to data properties or object properties. He believes that the community has learned a lot about what we are mapping to, which makes it easier to adapt to different institutions. Having well-populated VIVO profiles is important. Capturing more information and using more standards will bring the community closer to the needs of common ontology. This session presented outcomes from an investigation into integration and interoperability to promote a more open and networked research ecosystem. Presenters offered observations and solutions around how to strengthen research network interconnections and how to manage greater network complexity. Huda Kahn developed a modular solution that adds functionality to how the VIVO application already works. She can retrieve data formatted for display, but can also get the underlying RDF. The lookup is accomplished with the remote VIVO Solr index. It would be useful for the external lookup to go to CTSAsearch, an integrated index of researcher information harvested in VIVO data format from 65 institutions (or a SPARQL endpoint on that data). Eric Meeks pointed out that it is often easier to read HTML rather than the underlying structured data. Linked and Open data is challenging as a client. He does not want "the semantic to be the enemy of the good". A personal name resolution service would enable Huda Kahn's networked connections, suggested David Eichmann. He reviewed the services focused on identification of the individual that are integral to a networked research system. Moving forward while adhering to System of System (SoS) principles and engineering methodology can lead to improving an institution's ability to contribute to and participate in a VIVO-powered Networked Research Ecosystem. Jing Wang concluded the session with suggestions for how to reach that goal. Next steps could include integrating existing work into a planned software development sprint, starting to work with small interconnected networks to build trust, manage community expectations, measure performance and keep adding improvements in subsequent releases. What's in your outreach toolbox? Staff members tasked with encouraging faculty members to interact with campus systems will tell you that it is challenging to convince busy faculty members that the benefits of participation outweigh their investment of time. Cannon and Trimmer reviewed best outreach and engagement practices at Duke University where they have convinced a large portion of 5,600 Duke faculty members across schools and departments  medicine, nursing, school of education, law, Trinity College of Arts and Sciences, environment and engineering, public policy and the divinity school  to participate in developing faculty profiles for Scholars@Duke. There is no single way to reach all faculty members at a university across many school and department cultures. They developed a multi-faceted approach that involved planning different approaches to interest communicators or communication officers at each of the schools, IT team implementers and the Duke Office of News and Communications. Integrate campus news stories about faculty accomplishments into VIVO profile pages, which was seen as adding value. Start regular VIVO user group meetings. School Communicators (a formal staff designation) were a good source for outreach ideas. Regular office hours made training more convenient for faculty  no registration required. Host an information table at various venues on campus with materials that explain Scholars@Duke, promoting the value proposition. Schedule one-to-one one meetings with higher-ups and "super users" to understand challenges, manage their concerns and outline plans for moving forward. Host focus group lunches for 4-5 faculty members to find out what they liked the most and the least. Leverage collections of explanatory digital slides and posters for re-use by faculty and department heads. Duke's multi-pronged approach to engaging with faculty around populating Scholars@Duke has made it simpler to manage interactions between staff and the VIVO system. Cannon and Trimmer agreed that addressing complaints and coming up with solutions were opportunities to foster success. Trimmer concluded, " We were surprised by how many people wanted to go to lunch with us." Tweets from conference attendees may be found at #VIVO15 and #VIVO2015. These brief observations are useful in understanding broad concerns and community opinions on conference proceedings. Next year the 2016 VIVO Conference will be held in Denver, Colorado, August 17 - 19, 2016. Julia Trimmer, Duke University, will serve as conference chair, and Mike Winkler, Univeristy of Pennsylvania, is the program chair. Carol Minton Morris is Director of Marketing and Communications for DuraSpace, and is past Communications Director for the National Science Digital Library (2000-2009) and Fedora Commons (2007-2009). She leads editorial content and materials development and dissemination for DuraSpace publications, web sites, initiatives and online events, and helps connect open access, open source and open technologies people, projects and institutions to relevant news and information. She was the founding editor of NSDL Whiteboard Report (2000-2009) featuring information from NSDL projects and programs nationwide. Follow her at http://twitter.com/DuraSpace.